plant a victory garden. Our food is fighting. A garden will make your nations go further. 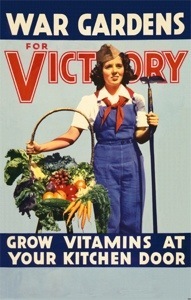 In wartime, patriotic families cultivated “Victory Gardens” to promote self-sufficiency and help the war effort. 1 c fresh edible flowers; bachelor’s buttons, borage, calendulas, carnations, herb flowers, nasturtiums, pansies. Toss salad and herbs in a large bowl; squeeze lemon juice over greens, season with olive oil, salt and pepper; toss. Add walnuts and feta, toss well; divide salad among for serving plates, top with flowers, serve.